Throughout the month of December, residents and visitors can visit Sandi Land and enjoy a spectacular holiday in paradise with tons of entertainment and festivities throughout the Downtown District. We have many places and many spaces. Enjoy FREE Parking in DowntownWPB on Jan. 1 in City Lots/Garages and Street Meters. Hop aboard Brightline and save using code WPBDDABL. CLICK HERE to book your next ride. 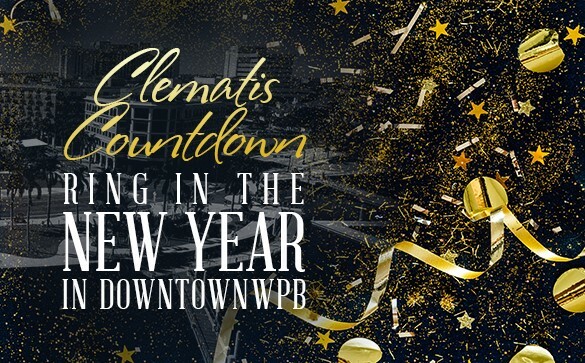 Ring in the New Year with a full menu of fun-filled concerts, dancing, balloon drops, dining and more non-stop entertainment along Clematis Street and beyond. Kickoff 2019 with a New Year’s Day Brunch on January 1st from noon – 4 p.m. Cost $30 per person. Tickets include your choice of one entree and bottomless Mimosas or Bloody Mary’s for an hour and a half. Reserve your spot today: Click Here. For more information, call (561)601-5843. Celebrate at 5 venues for one price! Hullabaloo, Kapow, Respectable Street, Lost Weekend and Voltaire have a couple of options on New Year’s Eve to accommodate everyone’s plans! $45 Well Open Bar at Hullabaloo, Kapow, Lost Weekend, Voltaire and Respectable’s. $65 Premium Open Bar at Hullabaloo, Kapow, Lost Weekend, Voltaire and Respectable’s. Pay a la carte! a/k/a “Pay as you go”; Buying a package is NOT required at all! No cover charge at Hullabaloo, Kapow or Lost Weekend however there is at Voltaire & Respectable’s for their entertainment (live music & DJ’s). Pre-sale ticket sales end at 4 p.m. on December 31st. Click Here to purchase your ticket. This New Year’s Eve gather your loved ones and let Avocado Grill handle the rest. Enjoy an incredible five course dinner hosted by Chef Julien Gremaud that will make 2018 a memorable one. Sittings are from 9 p.m. – 12 a.m. Cost is $149 per person and includes a glass of champagne. Reservations are suggested and can be made by calling (561) 623-0822 or by visiting avocadogrillwpb.com. Ring in the New Year at Banko Cantina and enjoy your complimentary champagne toast at the start of the new year. General admission before 11 p.m. is $20 and VIP premium open bar is $60 From 8 p.m. – 10 p.m. Dinner packages are available for a 4-person preset dinner which includes one bottle of champagne for $260 * tax and gratuity included. Bottle specials are also available. 1st Course: Shrimp Empanadas Lobster Bisque with Arugula Salad. 2nd Course: Your choice of a Ribeye Steak, Grille Salmon, Roasted Chicken or Vegan Plate Option. Sides: Roasted Potatoes, Steamed Vegetables, Sautéed Green Beans and Garlic Mashed Potatoes. Ring in the new year with Batch New Southern in style! Dress in your snazziest attire for a $45 10 p.m. – 1 a.m. open bar. Enjoy a DJ spinning tunes, an a la carte dinner menu and food specials, plus a complimentary champagne toast! For more information and to purchase tickets, Click Here. Live music from DJ Selecta Steve, champagne split, and party favors. Admission is $40. Click Here to purchase your ticket. For more info or table reservation, call (561) 408-1001 or visit camelotyachtclub.com. Are you ready for NYE Glitter Disco Party? The BIGGEST Waterfront Party to help you ring in the new year! Meet, greet and get ready for glittery photo-ops to commemorate 2018. Enjoy a delicious Prix Fixe menu, Live DJ, and valet parking. Dinner seating are 7 p.m. and 10 p.m. To reserve your table, call (561) 833-3520.
tart the first day with brunch on the waterfront at New Year’s Day Recovery Brunch. Seatings are from 8 a.m. – 1 p.m. To reserve your table, call (561) 833-3520. Ring in 2019 at Grease! Join them for a night of good food, good times, and good cocktails as we countdown to the New Year. For more information, call (561)651-1075 or visit greasewpb.com. Celebrate New Year’s Eve Italian style at Lynora’s West Palm Beach from 11 a.m. – 1 a.m.! Cheers the New Year with a champagne toast at midnight. For more information, call (561) 899-3117 or visit lynoras.com. Celebrate 2019 at O’Shea’s Pub with no cover all night from 7 p.m. – 3 a.m. on New Year’s Eve! Menu includes a special three-course dinner, with a free bottle of champagne included with purchase of four entrees or more. DJ will be providing entertainment in the courtyard, along with the Bside Band inside. Complimentary champagne toast and party favors at midnight! For more information and reservations, call (561)833-3865. Celebrate New Year’s Eve in style with all of your closest friends. General admission is $25 which includes no line VIP entrance, a champagne toast at midnight, and party favors. For table reservations call (561)833-6500 to secure a prime location. Click Here to purchase your ticket. Join them on New Year’s Eve for their final celebration of the year! Offering two seatings filled with delicious festive menu items created by Chef Isaac Cerny and live music starting at 7 p.m. Reservations are recommended. The early seating will include a 3-course prix fixe menu starting at 6 p.m. for $90 per person. The late seating and NYE Party will offer a 4-course set menu, live music with Mood Swing, and a champagne tower toast for $135 per person. For more information, visit pistachewpb.com. Countdown to 2019 at Rocco’s Tacos. Pop a bottle of Veuve Clicquot specially priced at $70 per bottle as the ball drops or toast to the New Year with one of Rocco’s Tacos signature margaritas. Open until 2 a.m., Rocco’s Tacos is the perfect spot to celebrate and dine on the last night of 2018. Featuring the restaurant’s signature authentic Mexican menu, guests may dine a la carte including Gaucho Platter and Seafood Molcajete, a variety of tacos (perfect for everyone from meat-eaters to vegans) and guacamole prepared tableside. Soak in Rocco’s fun-loving atmosphere and say salud to 2019! Enjoy complimentary party favors and Tequila Toast at midnight. For more information, call (561)650-1001. Make the first day of 2019 a celebration with an authentic Mexican brunch served from 11:30 a.m. – 4 p.m. Delight in breakfast favorites, such as Rocco’s Fuego Chicken and Churros and Huevos Rancheros or Rocco’s Tacos lunchtime classics like Yucatan, The Taco Burger and Torta De Pescado. Toast the New Year with unlimited Mimosas or Bloody Mary’s, or if champagne is more your style, enjoy a bottle of Veuve Clicquot for only $70! Let Rocco’s start your year off right! Join Roxy’s for their annual, Rooftop NYE party on December 31st. Cabanas and tables are available. Live music by DJ Kid Karter and a special guest. For more information, call (561)297-7699. Ring in the New Year at “Bubbles, Bangles & Beads” with live jazz at The Monk featuring The Blind Monk Quartet from 9:30 p.m. – 12:30 a.m.! Champagne specials all night long! Inside seating is $20 cover. For more information, call (561)833-3605 or visit theblindmonk.com. Delight on bites of their famous dishes including, but not limited to: Hand-Made Sausages, Pierogies and Pretzels. Enjoy an open bar beginning at 8:30 p.m., music by DJ Friendly, Chandon Champagne toast at midnight, and a live streaming of NYC’s Times Square Ball Drop. Cost is $65 per person. Click Here to purchase your ticket. For more information, call (561) 812-2336. Sandi and her friends illuminate Downtown West Palm Beach nightly with lights and bling. Guests can enjoy nightly magical music and light show each night that will enchant kids of all ages. Want to see what it takes to make a star ready for the show? Get a behind-the-scenes tour of Sandi’s Dressing Room, which includes accessories for all of her travel companions, too. New this year, Sing with Sandi at Sandiokie on Saturday nights from 7 -9 p.m. in Sandi’s Dressing Room – and even make your own video for posting! Monday-Friday: 6-10 p.m., Saturday-Sunday: Noon-10 p.m. Kids and adults will both enjoy creating their own life-size tropical snowman with fun mix-and-match pieces. Guests can take a seasonal selfie and share with friends up north. Drop a letter in the mail to Sandi, everyone’s favorite seasonal sand tree. Visit the mailbox in the West Palm Beach Visitors Center and drop her a line – then wait by your own mailbox at home, where she just might send you some salty and sassy holiday cheer! The Holidays are here! Step into the wonderland of “Santa Banko Baby.” Experience a venue unlike any other in South Florida. Banko Cantino has three floors, a rooftop with amazing views of the city and a special menu from now through January 6! Enjoy contests, giveaways, and MORE. For more information call (561)355-1399 or visit www.bankocantina.com.